We are a leading Service Provider of Trainings and Franchise such as Vedic Maths Trainings, Handwriting Improvement Trainings and Abacus Trainings from India. In order to meet the exact demanded of our esteems clients, we are engaged in offering Handwriting Improvement Trainings. This Program is dedicated to maximum legibility with maximum speed. With this program, students develop handwriting that will serve them for the rest of their lives. Smart writing is a handwriting course which is designed to improve the style and legibility of writing of the young & elders easily. 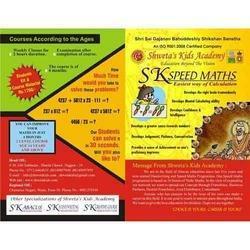 As per the variegated requisites of our esteemed clients, we are engaged in offering Vedic Maths Trainings. It includes arithmetic as well as algebra in very shortcut methods. This training is useful to crack aptitude test for Students who are Study for competitive exams like MPSC, UPSC and other competitive exams. The course enables the students to develop a respectable intellectual level seeking to expose the various concepts in Mathematics.